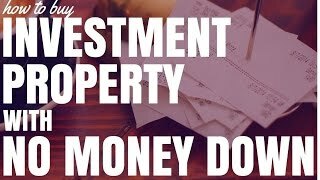 Can you buy investment property with no money down in Australia? The answer is most definitely yes. But it’s not as simple as going out and borrowing money from the bank. I’m going to show you how to buy investment property with no money down in Australia using 5 different techniques. Do you have existing equity in your home or in another investment property? You may be able to borrow against that and use those funds to finance a new deposit and purchase a new property. Accessing equity can be great because you can pull the money out of an existing property rather than from your own pocket. Your equity will also grow faster if you have more properties and more capital growth. This means you can access more equity and easily build your property portfolio. But what if you don’t have an existing property to get equity from? How can you invest with no money down? You could get a guarantor loan from the bank. Banks have started offering 100% guarantor loans if a friend or a family member is willing to guarantee a percentage of the loan. In the past they would have to guarantee the full loan. If you defaulted then they would have to sell their house in order to cover the cost of your mortgage. However many banks and other lenders now allow the guarantor to guarantee just 20% of the loan. The bank’s goal is to have an 80% LVR (Loan to Valuation Ratio) against you as the investor and have 20% secured either in cash or through the guarantor loan. So if you give 10% the guarantor might only need to support you with a further 10% on that loan. If you offer 5% they offer 15% and so forth. You will also have the option to remove the guarantor once the property goes up in value or after you pay down the debt. Owner finance is not as common in Australia as it is in other countries like the United States. But it is still possible and it is still legal in most states. Please check your local state laws as to whether you can do this or not. Owner finance is a direct agreement between you and the person selling the property. This means that you offer to assume a loan with the owner as opposed to securing a loan with a bank. You would generally offer to pay full price for the person’s property on the agreement that you would pay them on an ongoing basis without providing a deposit. I do have another article on owner finance and how it works. If this is something that interests you I suggest you look into it in more detail. I personally have not done a lot with property options. They do seem very difficult. I suggest that you check out Rick Otton‘s website if you’re interested in investing using property options. However the general notion of property options is that you approach a property owner and tell them that you would like to pay a certain amount of money in order to have the option to purchase the property. This means that you would have an agreement to purchase a property at a lower price if the property was to go up in value. You could have the chance to get a full loan for you purchase amount because the valuation of the property is higher. This is more difficult than a standard purchase. Some banks will look at the valuation and the purchase price and give you a loan for the lower of the two. You would need to secure the financing with a lender who would lend based on the higher valuation. Speak with a mortgage broker if you’d like more advice. Partnership agreements involve teaming up with someone else who has money while you do the legwork. Let’s say someone is money-rich but time-poor. They really want to invest in positive cash flow property but don’t have the time to find it. You could offer to find the property and do your due diligence under the agreement that they pay the deposit. You would help finance the property with your wage and go into the investment 50-50. This partnership agreement would allow you to purchase a property without using your own money. Of course there are some legal requirements surrounding this. It is advised that you seek professional legal council before entering an investment partnership so that you understand exactly how to split the profits or cut the losses. So there you have how to buy an investment property with no money down in Australia. Please browse through my other articles and videos if you are interested in learning more about how to save your deposit.